A few days ago, the BBC press office put out a press release detailing some of their US sport coverage. In particular, coverage of Major League Baseball’s World Series, and NFL coverage ahead of the International Series game at Wembley as well as other regular season games. The sport is broadcast on Five Live Sports Extra and is produced independently by USP Content. For some unknown reason the BBC’s press release only ended up in their RSS feed on the 24th October, whereas the release was actually published a few days earlier on the 21st. I mention that, purely because the first two World Series games had already been broadcast when the release was published. Anyway, I took part in a little Twitter discussion on the subject of this as a result of the BBC release (Their RSS feeds are invariably ingested into other systems and republished by a variety of automated Twitter-bots). An overall question being asked by some was why the BBC was broadcasting US sports at a time when so many cuts are being made. At this point, it’s worth noting that the BBC has been broadcasting US sport for a number of years now – both the NFL and the World Series. I’ve actually no idea what it costs them, but I’d be willing to guess it’s some of the cheapest radio they broadcast. That’s because it’s provided readily by the US sports organisations either free of charge or for a nominal fee. Yes, some additional production and editorial is required to take account of the relatively frequent in-game breaks, but we’re talking about a couple of individuals in each instance. Throw in a producer, and the cost must marginal at best. Both the NFL and MLB are keen to grow their respective sports – they always have been (I expect that they’re looking at the international success of the English Premier League with enormous jealousy – that’s why US owners have been coming over here). So is the BBC being a stooge by broadcasting this programming? No more so than when it broadcasts any sport. All the major sports organisations are major businesses. When we get coverage of the World Cup, the BBC (and others) are contributing directly to FIFA. And that’s a body we know has – well, let’s say “issues”, at its centre. OK. But isn’t this US sport of marginal interest to US listeners. Well I don’t think it is. Aside from the 190,000 or so US citizens (most of whom will be licence payers), there is actually quite a demand for US sport – and I don’t mean because you see NY Yankees caps everywhere. ESPN manages to run a full sports channel 100% devoted to US sport. 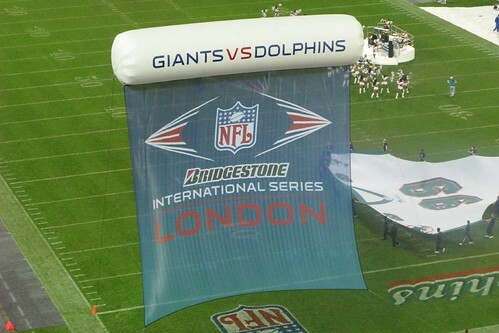 And Wembley stadium was pretty full at the weekend when the NFL staged their now annual International Series game (It wasn’t completely full though, whatever you might hear. Tickets were available just about up until the kick off). exploit sports rights owned by the BBC that cannot be accommodated by BBC Radio Five Live or Radio 4 Long Wave. However, it should not provide an additional outlet for which the BBC would bid for rights against commercial broadcasters. It should offer commentary based coverage of all the events and matches it covers. So one charge is that the BBC is acquiring additional rights for Five Live Sports Extra. The main station has broadcast both the World Series and NFL coverage in the past. Perhaps the BBC is treading a fine line here, but I’m not aware that any commercial stations are bidding to cover these sports. If Talksport wanted to broadcast NFL on a Sunday evening or baseball through the night, I don’t think the acquisition would be hard at all. Whether such coverage would beat their pretty decent late-night and overnight figures, is doubtful. That’s probably why they don’t. I think the broader question is whether listeners are gaining something from this sport being available? Unqualifiably yes. Not everyone can afford premium sports channels like Sky and ESPN where the television coverage resides (although C4 still has an overnight Sunday game), and as such it’s a driver to digital. No bad thing in my mind. Is it wasteful broadcasting American sport overnight? Not at all. There’s lots of listening to the radio overnight. 7.1 million people listen to the radio between 1am and 5am every week. I will declare a hand here. I really like US sport. I used to watch NFL on Channel 4 when it started, and it’s still fun to watch on Sunday evenings on Sky (Redzone under the red button is excellent). More recently, Channel 5 used to broadcast baseball on a regular basis overnight, including the World Series. That was before everyone handed their overnight capacity over to gambling outlets. I pay for ESPN as much for the baseball on ESPN America as I do for the extra Premier League and FA Cup matches over on the main channel. As I type this, I’m watching highlights of the fifth game in the World Series. When I was younger I would seek out a very flakey AM signal from the US armed forces radio in RAF Lakenheath (some 60 miles away), tuning in to listen to US sport overnight. I’m wasn’t alone. Do we complain when Radio 3 broadcasts classical concerts from Germany supplied by the EBU, or live opera from the Met in New York? These are arguably more important culturally to Germans or Americans than they are to British audiences. Yet some UK production is added to either live streams or pre-recorded concerts, and they’re appreciated by audiences in the UK. One of my highlights of any year is the live New Year’s Day Concert from Austria, and only the other day there was an EBU Liszt day on Radio 3 with music from around Europe. In the commercial world Real Radio repurposes Ryan Seacrest’s US show, and Planet Rock does something similar with Alice Cooper’s US show. We live in a global environment. And giving listeners otherwise unavailable programming, can’t be anything but a good thing. As ever, these are my own views, and don’t necessarily reflect those of my employer. Although the BBC shouldn’t usually judge things in this way, I think in this instance you really need to look at the RAJAR figures. Are they attracting a decent audience? If so then I see no problem with in continuing, if nobody listens then they’re clearly super-serving an audience that isn’t there. Having 90,000 at Wembley doesn’t really matter, League Two football play-off finals have huge Wembley crowds but that doesn’t mean the BBC should be covering games every week. I would ask why is it rarely cross promoted on 5 Live itself and also why aren’t some of the games on 5 Live? Especially at quieter times like Saturday evenings? The cost saving could surely come from putting this existing content on 5 Live and save the main station from producing anything else? I think that those are legitimate questions to ask. RAJAR is of no use measuring one-off events like the World Series. You’re only getting 13 week average data. But that’s not to say that Five Live Sports Extra’s NFL coverage isn’t measureable. You’re right that a full Wembley Stadium means nothing. But actually I think that covering a bit of League Two (and League One) football wouldn’t be such a bad thing. And effective cross promotion of digital stations is certainly someting that can be improved. I think that it’s true that too often the Sports Extra alternative is promoted in a very throw-away fashion. Generic trails that send people to Five Live’s website are not really enough – especially when said website “hides” their Extra service at the foot of the page. But all said and done, it’s better that Five Live does this than doesn’t in my view. Only just saw this. I disagree on a couple of points – of course – but you talk a good talk.